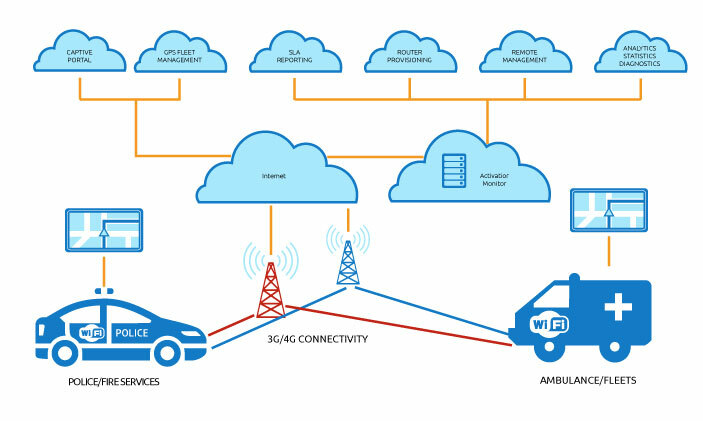 Resilient connectivity is a crucial requirement for emergency services. European police forces currently using Tetra networks to provide police communications need to add new services such as live camera feeds, internet and VPN access. This is not possible using Tetra due to data rate constraints, while dedicated LTE networks would be too expensive. The GW3300 offering dual radio, a combination of VPN, in-vehicle WiFi, dual 4G and mobile functionality, provides secure and persistent sessions for critical applications. The GW3300 meets demanding requirements such as resilient bandwidth, secure WiFi zone, GPS location services, and vehicle management connectivity using a single device. The router couples to a central server in the core of the network for configuration and monitoring. Activator automatically provisions the routers and OSS integrator provides seamless integration with IT systems.